Appligent Document Solutions’ professionals make your documents accessible to individuals who need to have the document read to them aloud using their computer. To read the document, the end user employs specialized software otherwise referred to as assistive technology (AT). To be read by this assistive-technology, documents need to be modified using tags that allow the screen reader access to the text and images of the document and provide a quality reading experience. Currently available software is not capable of automatically tagging PDF files for Section 508 certification. 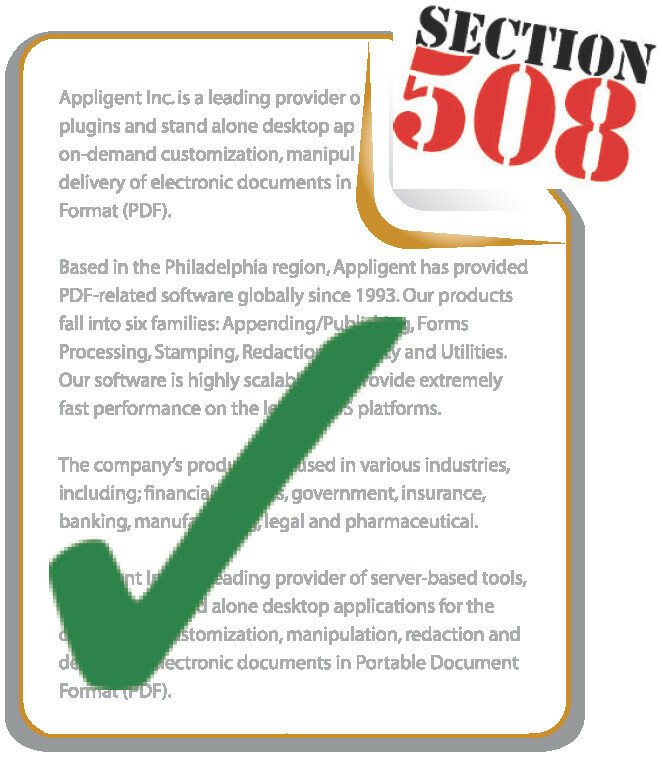 Appligent’s experts tag, check and validate documents for Section 508. Our service comes with our unique certification of Section 508 compliance: a simple, no-questions asked guarantee. There is no substitute for experience. Appligent’s professionals have been remediating PDF files for Section 508 compliance for more than ten years. Appligent’s PDF Accessibility Services go beyond basic Section 508 requirements to deliver truly usable and maximally accessible PDF content. For organizations needing to deliver Section 508 or otherwise certifiably accessible PDF documents, our Section 508 Remediation Specialists are ready and waiting to serve you. To get started, email your files to section508@appligent.com, and we will respond with a comprehensive quotation within 24 hours. If you have questions and would like to speak to someone, you can reach our Section 508 Coordinator at 610-284-4006.